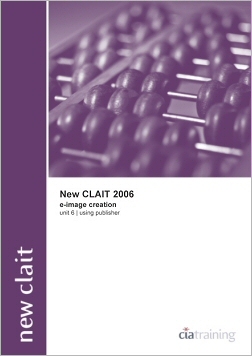 Use professional images in publications after studying this guide while gaining the knowledge to help you achieve the requirements set by the New CLAIT Unit 6 assessments. The guide will teach you how to use appropriate software to import, crop and resize images, enter, amend and format text, manipulate and format page items, manage and print publications. Endorsed by OCR. This product is available in 3 different versions. Click the Buy Now button at the top or bottom of the page to select the version you would like to add to your shopping cart.